Do I Need A Permit For Foundation Repair? Before work begins, find out if you need a permit for foundation repair. If you’re employing a reputable contractor, they will be able to answer that question. In the event that an initial structural engineer’s report is necessary, it’s should be the contractor’s responsibility to secure the permit for you. Keep in mind that almost all sizable Texas cities, including Arlington, Plano, Irving, Fort Worth and Dallas, do require them. The main reason is because the city can bring your project to a halt if you don’t get one. They can also assess a fee for failure to obtain the necessary permit. While the charges associated with these fees on residential foundation projects aren’t particularly large (usually less than $60.00), the time involved with delaying the completion of your project can be a major issue. You wouldn’t want a foundation repair company to start your 2 or 3-day project, and then suddenly have the city put a stop to it when it’s only halfway done. Even if the work is all being done in a single day, this is not a position you want to find yourself in. If you do not obtain a foundation repair permit before starting work, it could delay your project for several days (or more than a week), while you wait for the city to issue the permit. Who knows, depending on the situation, getting the matter resolved could take far longer than that. When you enlist a qualified professional, the contractor will deal with the city directly and obtain the permit in advance of the job. This is all part of what a legitimate contractor should do on behalf of their customer. IS AN ENGINEER’S REPORT NEEDED TO GET A PERMIT? Yes, if the city requires foundation repair permits, an engineer’s report must be submitted. Be aware that in order for the contractor to get the permit to make repairs, they must submit a structural engineer’s report to the city at the same time they apply for the permit. Since the initial engineer’s report comes at a price, that fee will be passed on to you. These types of charges are included in the overall price that the contractor quotes you. If you see no mention of a city permit or an initial engineer report in your contactor’s quote, you should most certainly inquire as to why it’s not included. Final engineer’s reports are a different matter and involve separate costs. It’s best to find out about these kinds of things in advance of having repairs in order to avoid an unpleasant surprise. WHAT DO FOUNDATION REPAIR PERMITS COST? Most permits in the Dallas, Fort Worth metroplex cost between $30 and $150.00. Some cities (like Grand Prairie) charge a flat fee for a permit, while others (such as Arlington) base the cost on the overall price of the foundation project. In a case such as that, the fee for a $10,000 project would be double the price of one that totals $5,000. Either way, the cost of a city permit for foundation repair service on residential projects is certainly not astronomical. If you think your home has issues and would like to have your foundation evaluated, contact HD Foundations. 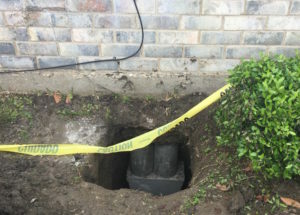 We service the entire metroplex and offer free foundation repair estimates.